The White Faced Spanish has the distinction of being the first chicken brought to the United States. They are good egg layers and have an unusual coloring. Size: Standard Male: 8 Ibs. / Standard Female: 6.5 Ibs. / Bantam Male: 30 oz. / Bantam Female: 26 oz. Comb, Wattles & Earlobes: They have a medium size, bright red single comb with five well-defined points that are upright in males and droop to the side in females. 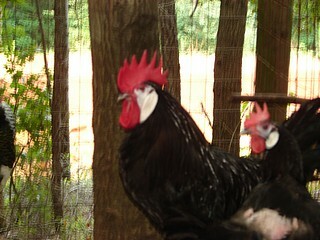 They have long, thin, bright red wattles with white on the upper inside in males. They have large enamel white earlobes. Color: They have a black beak and their eyes are a dark brown. The shanks and toes are a dark slate color. There are both blue and white varieties, but they are not recognized by the APA. Black: They have standard black plumage. Special Qualities: A good egg laying breed with unusual coloring. The heritage of this breed is unclear, but it is believed to be one of the oldest of the Mediterranean breeds. The Spaniards brought the first birds to the Caribbean region during the early colonization of the New World, making it also one of the oldest breeds in the United States. The breed is slow to mature, sometimes taking over a year to get to full maturity. They are also noisy birds and very active therefore doing the best in free range situations. They can tolerate confinement, but do not excel in it. They have quite varying personalities for one breed. You will get some that are plain mean, some that are stand-offish, and some that are downright charming and people friendly. The hens are very good layers and lay a large white egg. They do not tend to go broody.